This easy lemon meringue pie recipe is worth it's weight in gold. Simply divine sweet and tart flavor. Offering many fresh lemon dessert recipes below. In saucepan, mix 1-1/2 cups sugar, cornstarch, flour and salt. Gradually add hot water, stirring constantly. Cook and stir over moderately high heat until mixture comes to boiling. Reduce heat; cook and stir 2 minutes longer. Remove from heat. Slowly stir 1/3 of the mixture into egg yolks, then return all to hot mixture in pan while whisking. Bring to boiling and cook 2 minutes, stirring constantly. Add butter and lemon peel. Slowly add lemon juice, mixing well. Pour into pastry shell. NOTE: For creamier filling, cook and stir first five ingredients 8 minutes over low heat after mixture comes to boiling. Blend in egg yolks as above; cook for 4 minutes after the mixture boils. Beat egg whites at medium speed until foamy. Beat cornstarch and cream of tartar until soft peaks form. Gradually beat in sugar and vanilla at a high speed, until stiff, by not dry peak forms. Spoon meringue into large zip-loc bag and squeeze decoratively over lemon pie filling to edge of crust – or you may just spoon it on. Bake until golden brown at 350 degrees – 12 to 15 minutes. NOTE: Make sure meringue is right to the edge of crust to prevent filling from seeping out. It is important not to over-beat the mixture. Do not get the egg yolk in the egg whites or they won’t beat right. 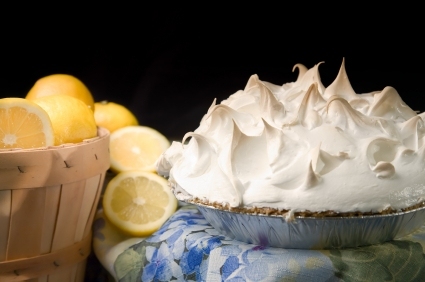 I have more than just a easy lemon meringue pie recipe, just click on the lemon dessert recipes link below.